A harried workaholic, Michael Newman (Adam Sandler) doesn't have time for his wife (Kate Beckinsale) and children, not if he's to impress his ungrateful boss and earn a well-deserved promotion. So when he meets Morty (Christopher Walken), a loopy sales clerk, he gets him to bypass life's little distractions with increasingly hysterical results. But as Michael gleefully mutes, skips and scans past his family and his friends, the remote gradually takes over his life and begins to program him, in this fast, funny and out-of-control comedy adventure. A modern take on "It's a Wonderful Life" that I enjoyed. The movie dragged a little when Adam Sandler first tries out the power of the remote control, but this is needed to set up the side-effect of it. That part I enjoyed. The part about how the remote automatically skips similar things in his life which he skipped before manually. And thus skips huge junks of his life. This was the part which qualifies it for me for my time-travel movies thread. where Adam Sandler's character dies after urging his son not to make the same mistakes as him (putting his career before his family). and everythings turns out to be a dream. On the one hand, I am a bit disappointed about this, because it is just such a Hollywood ending, but on the other hand how did I expect a "It's a Wonderful Life" story to end? There are also some fun cast to watch. Christopher Walken as the angel. Unexpected surprise is David Hasselhoff, who did a good job playing the boss. Julie Kavner (voice of Simpson's Marge) and Henry Winkler (Fonzie) appear as Adam Sandler's parents. And Kate Beckinsale is really hot in this movie. Lose yourself in timeless love with this gloriously romantic story of the journey of two hearts. Artist Clare Abshire (Rachel McAdams of The Notebook) shares a deep emotional bond with Henry De Tamble (Eric Bana of The Other Boleyn Girl), a handsome librarian who travels involuntarily through time. Knowing they can be separated without warning, Clare and Henry treasure the moments they have together, imbuing them with the yearning and passion of two people imprisoned by time... and set free by love. 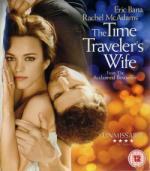 Based on the #1 bestseller The Time Traveler's Wife weaves together destiny and devotion, past and future to turn an extraordinary love into an extraordinary love story. I enjoyed this movie. The pacing is similar to Rachel McAdam's other movie I have seen: "The Notebook". The time-travel aspect has been used well. I didn't notice any obvious mistakes on the writer's part. What if you had the chance to travel back in time and change just one event in you life? What would it be? For John Sullivan (Jim Caviezel) there is no question. He would undo the events of 12 October, 1969, when the out-of-control Bruxton fire took the life of his father (Dennis Quaid), a heroic firefighter. Now John may get exactly what he wished for...and much more than he bargained for. In the mind-bending science fiction thriller Frequency, director Gregory Hoblit (Primal Fear) presents an original take on time travel with the gripping story of father and son who reach out to one another across parallel universes to stop a terrible crime. Not directly time-travel, but with the protagonists communicating with each other through time and thus affected the history, it counts as a time-travel movie for me. I liked this film, even though it is not 100% consistent how the changes in the past affect the present. Also it moves a little slowly at times, especially in the beginning. I really like Frequency. Very underrated and great fun. Jiro is a loner. Every year he buys his own present and celebrates his birthday alone in the same restaurant. This year a beautiful, but kooky, girl joins in his celebrations and they spend the rest of the evening doing crazy things and having fun. Then, following a cryptic speech, she disappears. A year later the girl turns up again, except this time she is a cyborg from the future... Her function is to protect him and the world around him. A romantic comedy on a grand scale, with an ending that will satisfy fans of romance and robot action alike. I had great fun with this movie. It seemed to touch upon different genres. First it reminds very much of Terminator. Then it goes more in the direction of romantic comedy with a cyborg. Then it moves a little on the dramatic side. Then it gets to be a little disaster movie, and ending with a sci-fi time-travel twist. After watching the movie I had to draw up the timelines to see if I am satisfied with how the time-travel was handled. After doing it, I am tending to liking how it is handled, even though there are some things you have to take at face value. P.S. I made the effort to draw up my drawing on my computer and attached it to this post. Of course it is a complete spoiler! Hundreds of years after humans have settled on Mars, Regulator Rogul and Lord Jens Maul, lead a force of Martians to Earth in order to conquer the planet. Queen Metaphor looks to the gay heroes aboard the spaceship Surprise -- Captain Kork, Mr. Spuck, and first engineer Schrotty -- for help. After watching "Cyborg She" yesterday, I got in the mood to watch some time-travel movies again. This one is a guilty pleasure of mine. It is a Star Trek/Star Wars parody based on a sketch from the German comedy show "Bullyparade". I think the delivery and editing is really done well in this movie, which make even the bad jokes funny. With the time-travel device we even got a chance to see characters from Bully's previous movie (a western parody based on Winnetou sketches from the Bullyparade) again. Interesting idea, but a rather boring movie. Although it has a cheap TV movie kind of feel to it. I am not sure if it is a TV movie though. At least it is in 4:3 format on my release, but again I am not sure if that is full screen or pan & scan. Ray (CHRIS O’DOWD - The IT Crowd) is obsessed with time travel and all things sci-fi. Toby (MARC WOOTON - Confetti) is a film nerd with an ambition but absolutely no talent and their mate Pete (DEAN LENNOX KELLY - Shameless) is a sarcastic cynic who prefers darts to Darth Vader. When Ray is approached by Cassie (ANNA FARIS - Scary Movie, Lost in Translation) a beautiful girl who claims to be from the future, and Pete stumbles through a rip in the time space continuum in the gents, the three bunglers quickly realise there’s going to more to their evening than peanuts and the pub quiz. This self-referential Brit-flick draws as much on your grey matter as it does your stomach muscles, and asks, if not completely answering all the questions you ever had about time travel but never had the time to ask. Parallel Universes? Paradox arcs? Grandfather theory? And most importantly will they get back in time for last orders…? A nice little movie with some interesting time-travel. But in all it misses the little something. Though it is still worth to check it out. Strictly speaking, with "Cyborg She" it doesn't work. But the emotions are fitting and I can forgive it. Though I had to draw up a diagram to see how far off they were. You have to accept the fact, that the woman in the beginning is coming from an alternative timeline and not from the original. So the cyborg was modelled after a woman, who only came back in time because the cyborg which was modelled after her was sent back in time in the first timeline. If you know what I mean. A young man struggling to get over disturbing memories from his childhood discovers that he is able to travel back in time and alter events in his past. However, every change he makes transforms his life and that of those around him, often to unexpected and disastrous consequences. Theatrical Cut and Director's Cut with alternate ending. The weak point in this movie is Ashton Kutcher. He can't act. He drags the pacing down. I almost didn't recognize him with all the makeup, but Ethan Suplee (Randy from My Name is Earl) played Evan's fat roommate in college. I actually thought Ashton did ok in this. Not great, but for me, the weak point was absolutely the horrendous script. I really can't see why this film got any kind of the following it did, it's just awful.